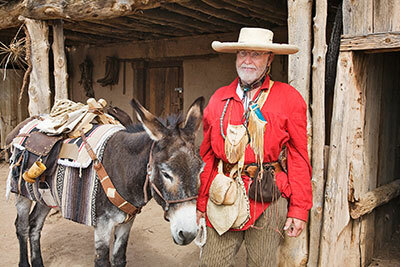 Here is a short list of Santa Fe attractions that often get passed over—unjustly so, to our way of thinking. Some are a bit out of the way; others are just a few blocks from the Plaza. All will reward your time and effort with a great experience and no crowds. Located just a few blocks west and south of the Plaza, the Guadalupe District was originally a small farming community clustered around the Santuario de Guadalupe, an 18th century church that is billed as the oldest shrine to the Virgin of Guadalupe in the US. The neighborhood also marked the northern terminus of El Camino Real or Royal Highway (now Agua Fria Street), for centuries the main trading route between Santa Fe and Mexico City. Guadalupe became a commercial district after the railroad arrived in 1880, and the farms gradually gave way to shops and warehouses. Today, the district contains an eclectic mix of restaurants, antique shops, clothing stores, and other locally owned specialty shops that are very popular among locals. The grittiest part of the neighborhood, mostly abandoned and languishing until just a few years ago, is being redeveloped as a trendy new commercial neighborhood. Comprising the district’s southern half (below Montezuma St.) it includes museums, contemporary art galleries, specialty shops, restaurants, the Farmers Market, and a freshly landscaped public park. Of course, the defining historical feature of the Railyard—the old Atchison, Topeka and Santa Fe rail line—is the centerpiece of the new development. The tracks terminate at a 1909 Mission style depot which is the boarding point for the Santa Fe Southern Railway’s sightseeing excursions, and for the New Mexico Rail Runner commuter trains which connect Santa Fe with Albuquerque and other points south along the Rio Grande. One of the foremost Native American artists of the 20th century, Allan Houser (1914-1994), produced 450 limited edition bronze sculptures and more than 500 unique works in wood, stone and fabricated metal during his 60-year career. About 85 of these sculptures can be viewed in a beautiful 12-acre garden at the compound he built south of Santa Fe in the 1980s. Knowledgeable and friendly docents lead visitors through the garden, recounting Houser’s many accomplishments and offering insights into his work. The grounds include a visitor center, gallery, and gift shop. The hilltop site also affords spectacular 360-degree views of the Galisteo Basin and the Sangre de Cristo, Jemez, Sandia and Ortiz Mountains. Reservations are required. This parish church was completed in 1940 to commemorate the 400th anniversary of Francisco Vásquez de Coronado’s exploration of the Southwest. Designed by John Gaw Meem, practitioner of the Spanish/Pueblo Revival style in Santa Fe, the church is said to be the largest Spanish-style adobe church in the United States and is certainly one of the most beautiful. Massive beams spanning the nave give rhythm and decoration to a building that is otherwise magnificent in its simplicity. The church was constructed largely by parishioners who made more than 180,000 mud-and-straw adobe bricks which they laid around a steel superstructure. The 225-ton stone altar screen was carved in 1761 for La Castrense, a military chapel that once stood on the south side of the Santa Fe Plaza. A side door to Cristo Rey church is usually open between 8:00 AM and 7:00 PM; the front doors are locked except for Mass. This distinguished stone structure is one of the few Victorian era buildings in Santa Fe that has not been disguised with a faux adobe skin. Intended as the territorial capitol, construction began in 1851, three years after New Mexico was ceded to the U.S. from Mexico. After the exterior walls were erected, Congress stopped funding the project and it took 38 years to complete the building. By the time the structure was ready for occupancy in 1889, New Mexico Territory already had built another capitol on the south side of the Santa Fe River. A small exhibit inside the Federal Courthouse chronicles the building’s history, which is even more absurd and comical than we can relate here. The highlight of the building, however, is six magnificent landscape murals painted by Santa Fe artist William Penhallow Henderson in 1938. Located just two blocks north of the Plaza, this building is a seldom-visited gem right under everyone’s noses. SAR houses one of the world’s finest collections of Southwest Native pottery, weaving, and painting. Including both historic and contemporary pieces, it is an amazing concentration of the “best of the best,” and a required visit for anyone seriously interested in Southwest Native arts. Public tours are offered each Friday at 2:00 PM, reservations required. After your tour, stroll the beautiful grounds and admire the adobe home that artist William Penhallow Henderson built in the 1920s for Amelia and Martha White, wealthy sisters from New York. A long-time supporter of Indian arts and SAR, Amelia donated her Santa Fe property to the School when she died in 1972. This park was created to protect dozens of cone-shaped rock formations, or hoo-doos, which tower up to 90 feet above the eroded floor of the Rio Grande Valley. Eruptions of the Jemez Mountains, six to seven million years ago, deposited volcanic ash in layers more than 1000 feet thick. Over the millennia, wind and water cut into these deposits, eventually carrying away most of the rock until the tent rocks were all that remained. The layers of volcanic ash vary in color from grey to beige to pink, giving the Tent Rocks a beautiful horizontal banding. Two hiking trails interpret the flora and fauna of the region. Humans have occupied the area for more than 4000 years, and the ancestors of the modern day Cochiti Pueblo settled near the Tent Rocks in the 14th century. Kasha-Katuwe means “white cliffs” in the Keresan language of the Pueblo. New Mexico has the distinction of having the oldest capitol building in the U.S. (Palace of the Governors) as well as one of the newest. The present capitol, built in 1966, is a round structure with four radiating projections that give it the form of the Zia Sun, the symbol found on our state flag. The building—including its grounds—is a de facto art museum, containing an excellent collection of traditional and contemporary work by New Mexico artists. Painting, sculpture, weaving, pottery, furniture, and other art forms are represented. The Governor’s Gallery on the 4th floor is a venue for changing art exhibits created for the capitol by the New Mexico Museum of Art. Guided tours of the building and collections are available; call for times. Comprising 33 historic structures on 200 acres, this living history museum portrays the daily lives of northern New Mexico ranch families in the 18th and 19th centuries. The original Golondrinas Ranch buildings date from the early 18th century, and other historic structures from northern New Mexico have been reconstructed here. Villagers clothed in the styles of the times demonstrate period ranch work and household tasks. Occupying a green valley surrounded by pinon and juniper covered hills, the museum is a peaceful place just to stroll and enjoy nature in addition to learning about life on the frontier. Las Golondrinas is an excellent outdoor activity for families, and a great experience of early New Mexico for all visitors. Check the Visual Arts Calendar for special weekend events, spring through fall. This 135-acre property was the home of artist Randall Davey, a famous New York modernist painter and associate member of the Taos Society of Artists. When Davey bought the land in 1920, he converted an old stone sawmill into his home and studio. They now are preserved as a museum with the Daveys’ original furnishings as well as many paintings by the artist. Nestled in the Santa Fe River Canyon, the property is owned by the Audubon Society which maintains two hiking trails for birders and other nature lovers. Adjacent to the Audubon Center is The Nature Conservancy’s Santa Fe Canyon Preserve, 190 acres of open space that includes a 1.5-mile interpretive hiking trail.